And the next party feature goes to this delightful SUGAR PLUM NUTCRACKER WINTER PARTY submitted by Suzanne Olvey of Fanciful Events. 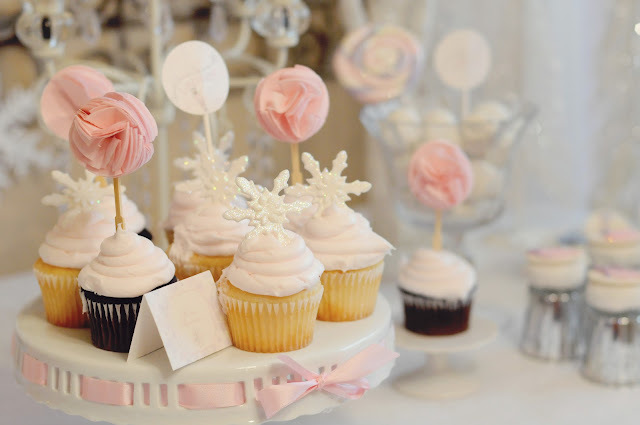 Now this is such a pretty party. What a dreamy winter wonderland! 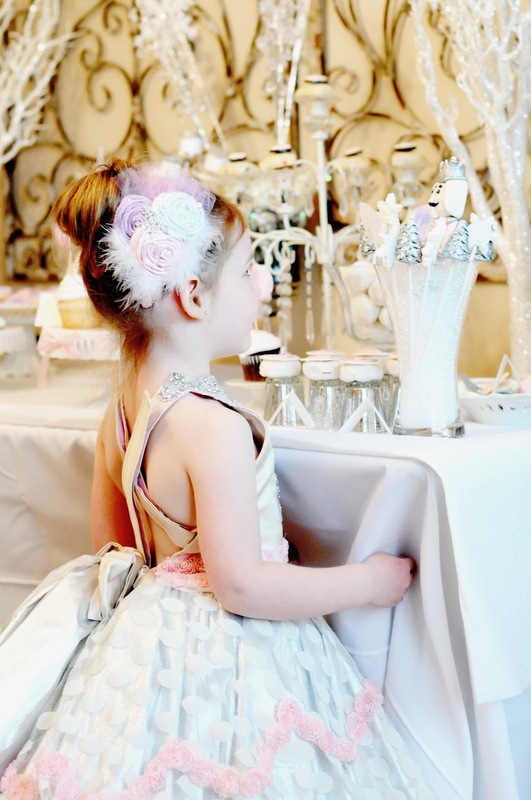 Suzanne styled this party for her daughter, Clara's birthday. So much love went into every detail. 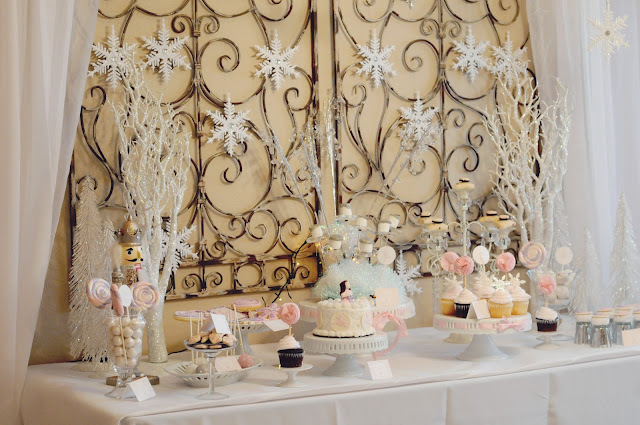 Here is what Suzanne said about the party- "I decided to base the theme around Clara's love for the Nutcracker and her dream of traveling in the beautiful wintry wonderland and seeing the Sugar Plum fairy and her candy kingdom of sweets. 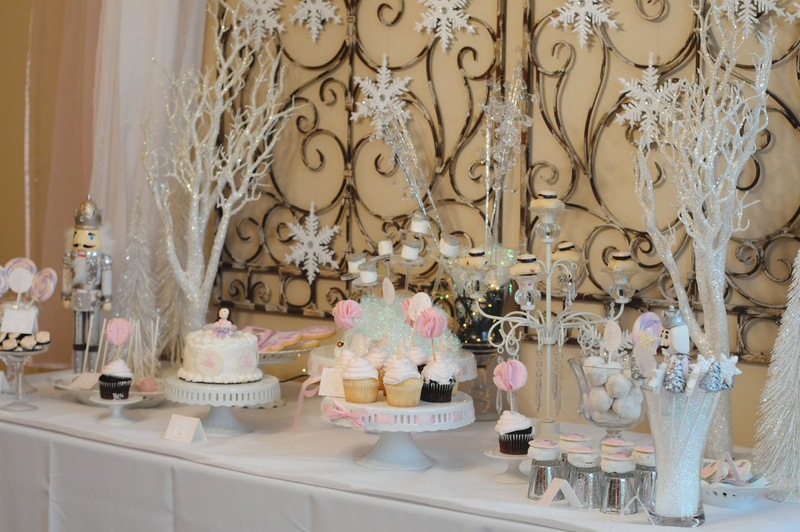 I decided to go with a winter white theme and make it all sparkly and magical! I tried capturing Clara's love and wonderment for her Nutcracker and the enchantment she felt and experienced in her dream. 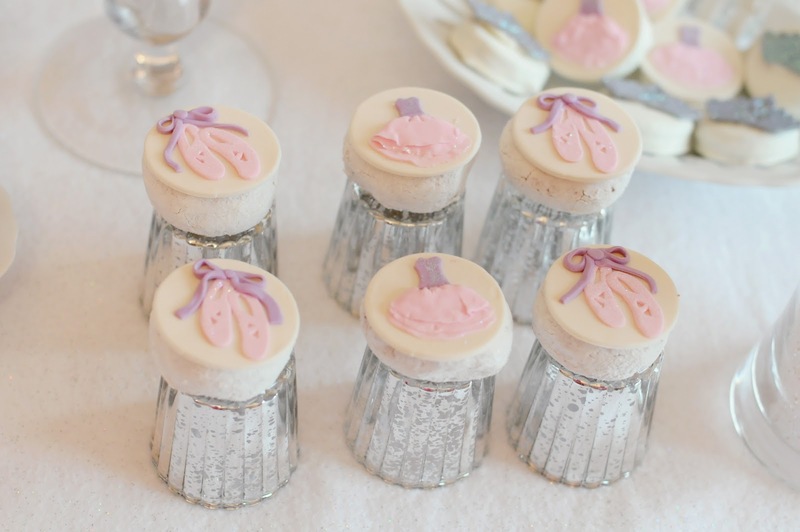 We had so many wintry sweets that included cupcakes, marshmallow pops, cake pops, chocolate covered oreos, sugar cookies, wintry scones, peppermint bark candy bites and a sweet little ballerina cake that featured Clara and her love for ballet around it. 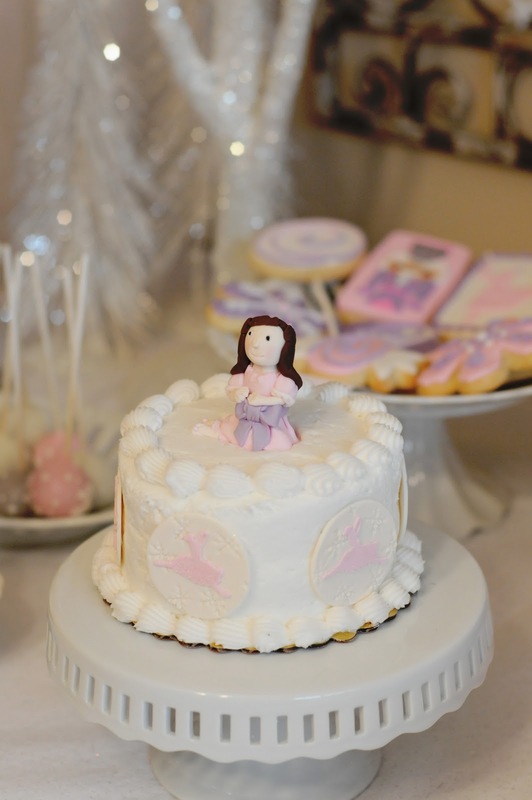 All the amazing fondant toppers were made by Brittany from Edible Details and just beautiful and stunning! 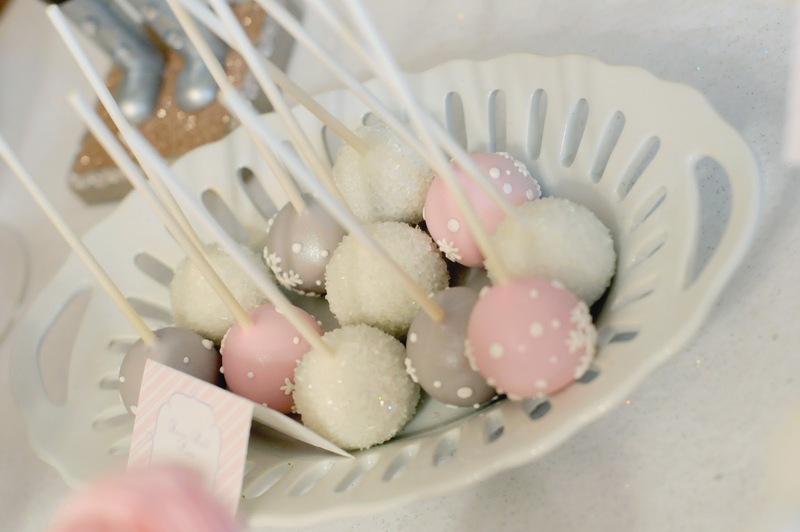 They shimmered and sparkled like a winter wonderland! We had a little table for the girls that was whimsical and showcased the love for all things sweet! 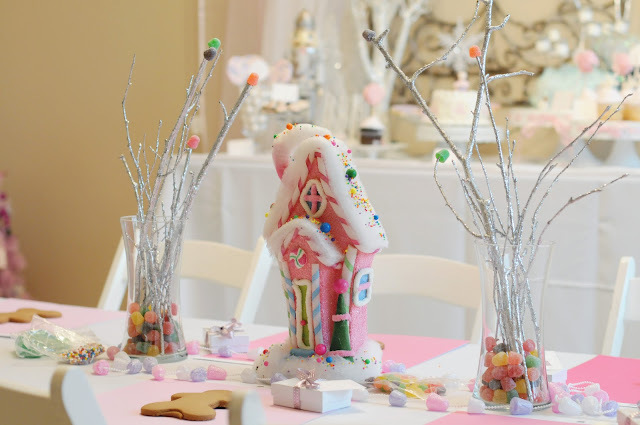 They found on their table a gingerbread man cookie that they could decorate and also had little bracelets awaiting them with their name on them and they also got to take home a beautifully wrapped gift that had a sweet pajama set with a ballerina tutu of course! They loved the wintry room with all the sparkly sweets and ballerina and Nutcracker touches. 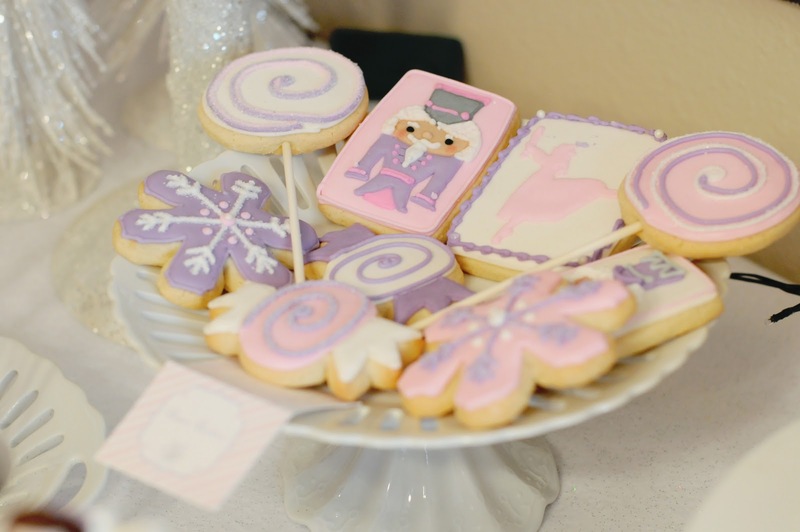 It was truly a sweet wintry wonderland filled with visions of sugar plum dreams and certainly sweet things! 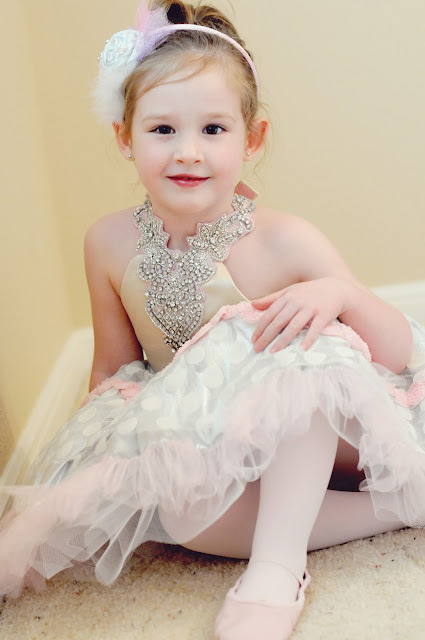 We had the ballerina dress especially made for this party so my daughter could feel like a true ballerina! Of course she loved the dress and didn't want to take it off. This has been one of my favorite parties that I've done so far!"